One cable had plugs that connected the PC's serial port to the camcorder's LANC remote control port, and also had an IR Blaster. Another cable connected the purple box to the PC's parallel port. Cables also connected the camcorder's video output (composite or S-video) to the purple box input, and camcorder audio connected directly to the PC. Video output from the purple box was connected to an output VCR, and a power brick connected to the purple box,. Wow! That created quite a jumbled mess at my workstation. Studio 200 used commands from the PC's serial port to start, pause, and stop the camcorder. Video was fed through the purple box, which translated it into a lo-definition MPEG preview of the videotapes. Automatic scene detection displayed thumbnails of clips on the computer screen. Editing interface was simple, a precursor of today's popular Pinnacle Studio software. That old computer handled and edited low-definition proxy files surprisingly well! A simple storyboard view made it easy to quickly arrange the sequence of a story. Then it could be switched to a timeline which had five tracks: VIdeo; Titles; Video Sound; Sound Effects; and Music. I could now add an assortment of transitions, titles, and still pictures to my productions! Input of the raw video sounds complicated, and it was. Assembly of the edited production was even more so; a robotic sequence that frequently failed. 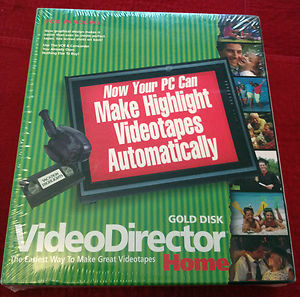 Video Director would set the VHS recorder to "record", pre-roll, then pause it. Then it would rewind or fast forward the playback camcorder until it was close to the needed timecode. Then the source would play at normal speed. Now Video Director would un-pause the VHS recorder and it would begin recording. This ballet became even more complex if the program needed to overlay a still or title from the computer. It was actually quite miraculous that Pinnacle was able to achieve any success with the deadly combination of consumer video equipment and early versions of Windows. Nevertheless, these cumbersome techniques were a vast improvement over what I was doing before. As you might expect, imperfect sound was always a problem. Edit points were only accurate to within one or two frames; sound that carried over a transition point was always "glitchy". The best workaround was to output a continuous soundtrack from the software, then use that to overwrite any sound on the VHS tape. Generation loss was always a concern with tape-to-tape edits. I was very satisfied with the quality of my 2nd-generation edited master. Duplicated copies were 3rd-generation, so my friends received VHS copies that were lesser quality. We visited India and Thailand in 1997, by land, air, rail, and cruise ship. I came home with ten hours of 8mm analog source tape. Unfortunately the camcorder became mis-aligned during the trip; several hours of that video are not usable. Normally that would have meant that the Taj Majal was not in the final production, But with Video Director Studio 200 I could tell a complete story using digitally-scanned still pictures, titles, and fancy transitions. Bottom line ... my first digitally-enhanced production was a 78-minute video memory of our first trip to India. The example from YouTube is my opening title sequence. It uses wide and close-up photos of a marked-up map to outline the destination cities, plus overlay stills of photos to illustrate those destinations. There's a sound effect and local music. Looks like I was trying to do it correctly, and I didn't over-use any of my new tools. I remember being very excited at the time I produced this ... and I still like it! Use whatever tools and source material you have to tell your story. Use an opening title to let the audience know where you intend to take them. Don't be afraid of new technology. Grab it, learn it, run with it! This is a short excerpt from one of my older edited videos. It contains some unidentifiable music that I acquired locally while on vacation. Nevertheless, that artist has certain rights. This video is intended for illustration and educational purposes only. Please understand that I do not encourage improper use of copyrighted material.